Fruit juice may be part of your morning breakfast routine, but some argue that even the natural sugar found in 100 percent juice, is partially responsible for the obesity epidemic and the debilitating diseases that may follow. But does the fruits' healthy vitamins and antioxidants trump any negative influences it may have on our bodies? Natural and/or added sugars may be found in the foods and beverages we consume. Whole fruit contains natural sugars, as do nutritious vegetables and dairy products. One hundred percent fruit juice will contain sugar, but only natural sugar. Juice that is not labeled as 100 percent fruit or vegetable juice will include added sugars such as, corn syrup, high fructose corn syrup, glucose or sucrose. Added sugars account for 16 percent of total calories in Americans' diets, and half of these sugars come from sweetened beverages like soda, energy drinks and "fruit drinks." Diets high in added sugars can lead to weight gain, high blood pressure, and high triglycerides. Just like any liquid beverage, fruit juice may easily be over-consumed. The 2010 Dietary Guidelines for Americans recommends adults have no more than ½ to 1 ¼ cups (4 to 10 ounces) of fruit juice per day. For children ages 1 to 6 years, the American Academy of Pediatrics recommends no more than 4 to 6 ounces of fruit juice per day and 8 to 12 ounces for children ages 7 to 12 years. As long as children are offered whole fruits and nutritious milk, it's okay to not make juice an everyday occurrence. 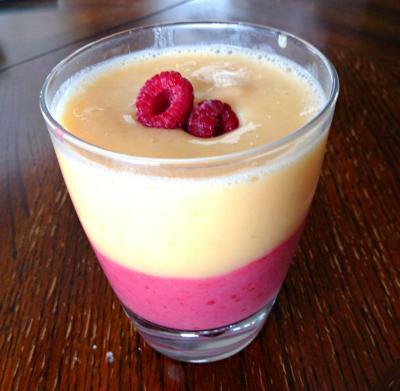 Place raspberry ingredients in a blender and blend until smooth. Divide and pour into two glasses. Rinse out blender. Place peach ingredients in a blender and blend until smooth. Divide and pour on top of raspberry layers. Serve immediately.